Brain Injury: Work injury where I was hit by a piece of equipment on a construction site. Explanation of Mask: This is the first mask I have painted. It makes me have spirit to move on to other things. This project has inspired me more than other projects. It gave me an understanding into my mind and into my soul. At times when it was hard, I never gave up and kept moving forward. I thank God for not allowing me to give up and for inspiring my artwork. 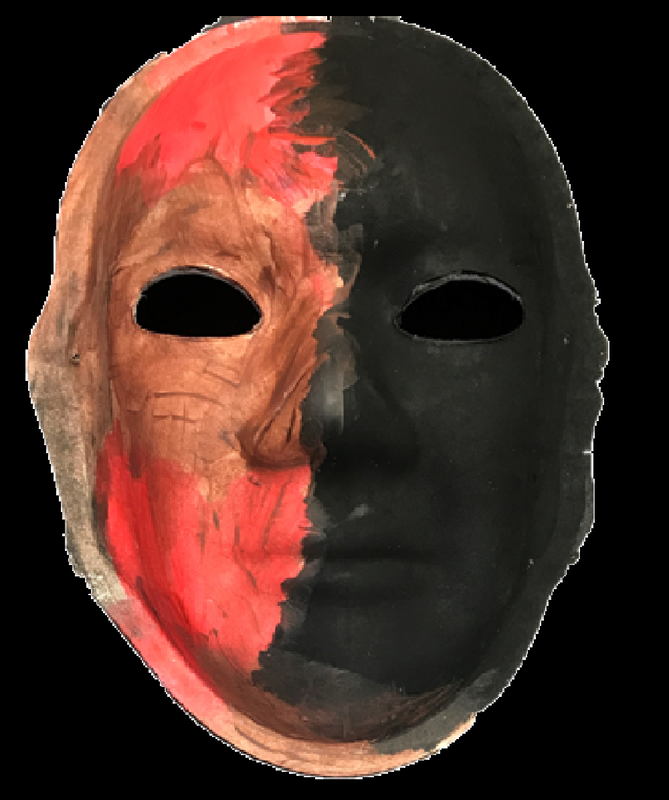 Explanation of Mask: I wanted the paint to be represented on my mask. The red band represents the side effects of a medication I took because of the accident. The medication caused me to go blind. I physically cannot see but emotionally I can see that I am lucky to be alive. That is why I used a lot of bright colors on the bottom half of my mask. The image is of my parents when they were at their happiest. I feel a lot of pain and sadness from my accident but I want people to know that I still feel happy at times too. 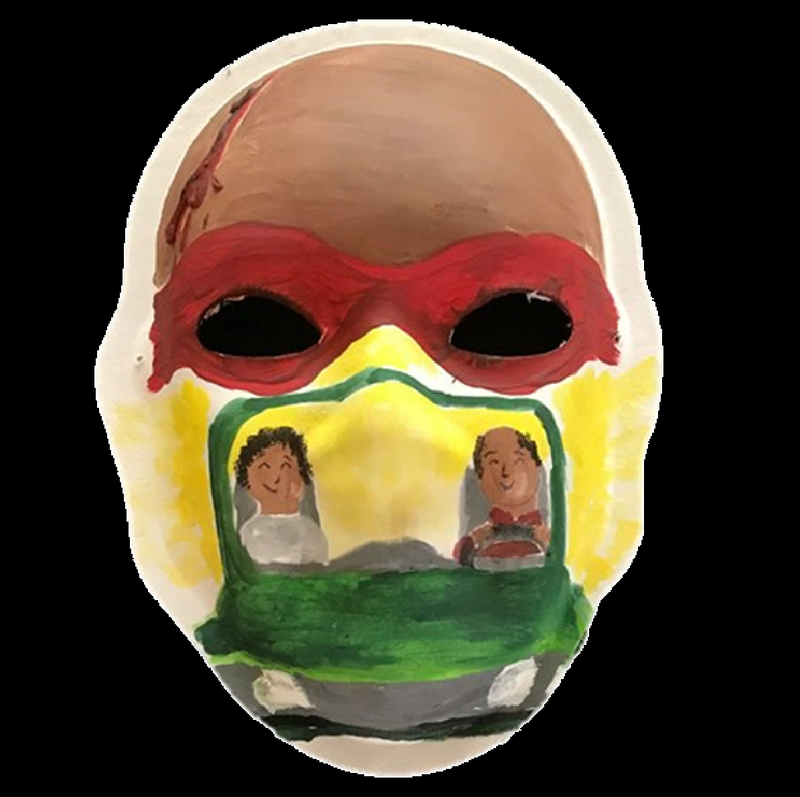 Explanation of Mask: While I was in a coma, my wife was involved in a motor vehicle accident, which took her life. I learned of her passing upon waking up from my coma. I am learning to live life again with the situation I have been given. I am thankful to have my current life with my children and my friends. 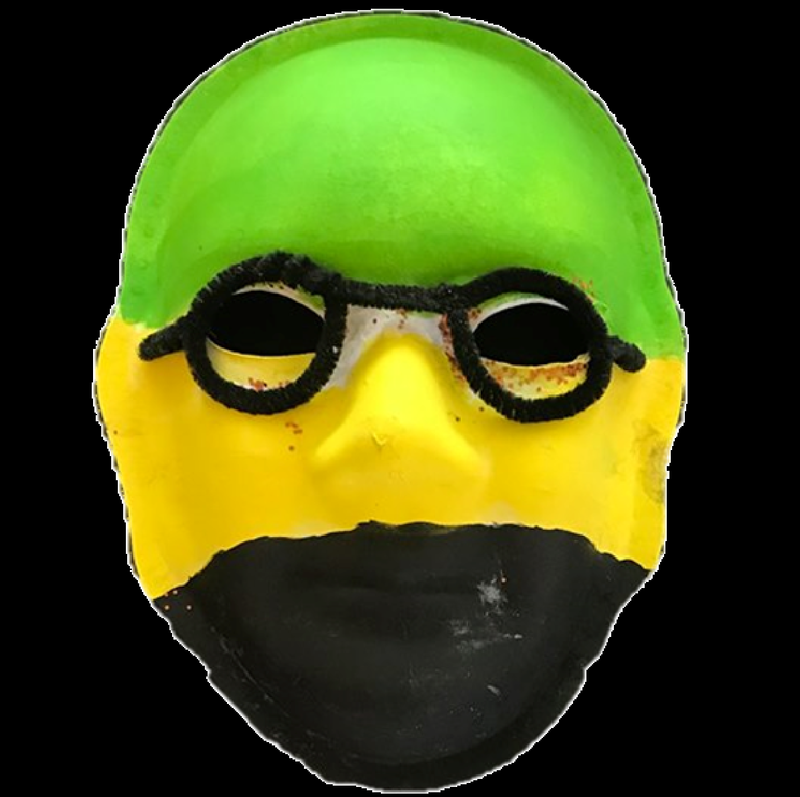 My mask represents all of the emotions I have felt during this difficult time bu also of the better times I am having now. Explanation of Mask: Through my assault and various injuries and struggles that followed, I have felt a lot of mixed emotions. The experience has tested who I am as a person. I wanted my mask to look confusing and messy because that is what it feels like in my head sometimes. I am often tired and lonely. But I do find humor in day to day things, and that is what helps me get through each moment. 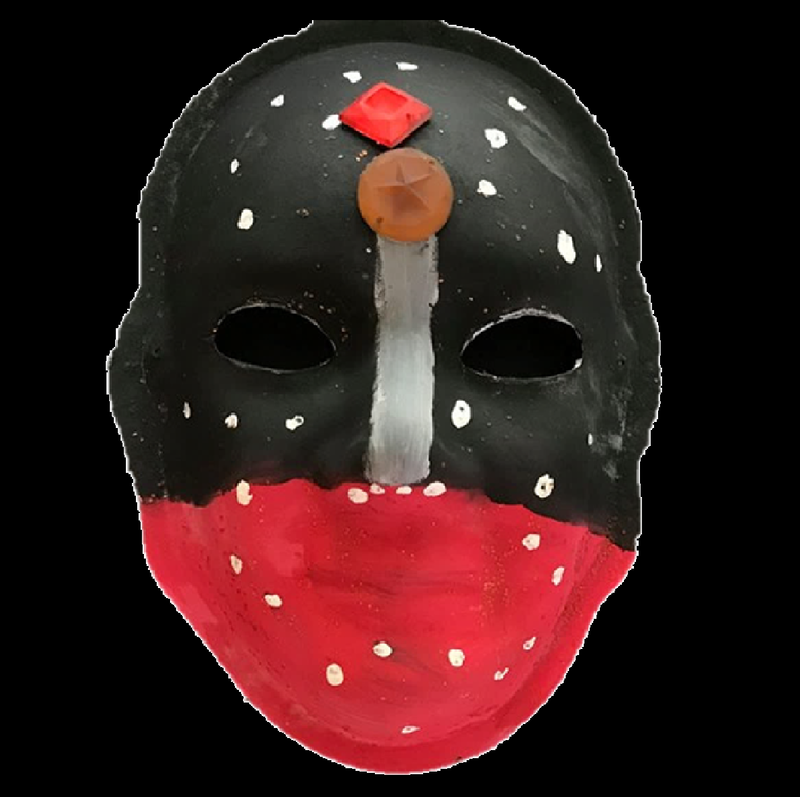 Explanation of Mask: My mask represents how I have loss of vision in my left eye. The white color represents the clear memories of my past. The mixture of black and purple around my mouth represents my difficulty speaking, eating, and drinking. Yellow represents the bright side of my life even with my traumatic brain injury. I try to have a positive outlook on life. Brain Injury: Work related accident where I was hit by a very large bolt. Explanation of Mask: Hopeless, cheated, afraid and anger… these are just a few of the emotions I feel and wanted to show on my mask. I feel I have been cheated out of my life and spending time with my family and friends. Much of my time is spent being afraid because I suffer from memory loss. I am also very angry at my situation so I tried to show that on my mask. Brain Injury: I was a paramedic riding on the passenger side of an ambulance when we were hit by a train. 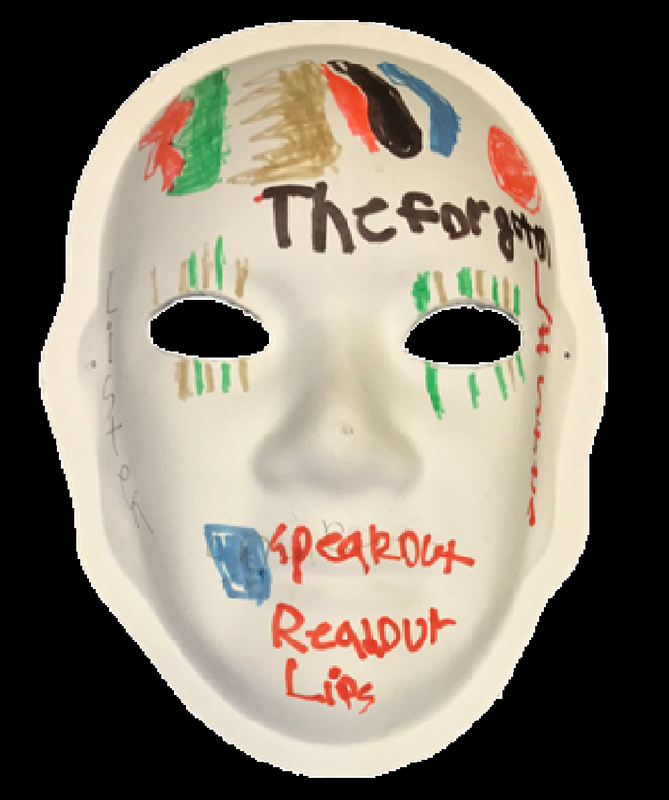 Explanation of Mask: I painted my mask to show the memory loss, vision loss and trouble I have speaking. While my days are challenging and my emotions range from time to time, I am thankful for all of the memories I have and the life I still get to live. Brain Injury: Hit by a train while in a car with my family. 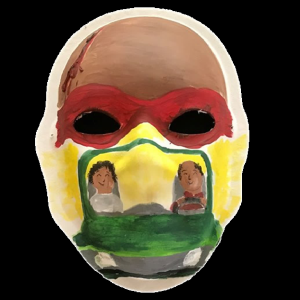 Explanation of Mask: My baby brother died as a result of the train accident and also one of our friends. Even though I have physical and mental injuries that will last the rest of my life, I am thankful for the great life I still get to live. I have many wonderful family and friends who love and support me and that means so much to me. 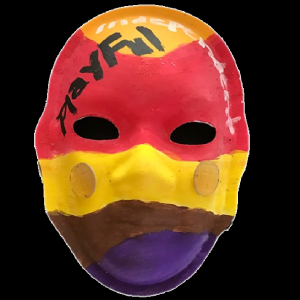 My mask represents all of these emotions. 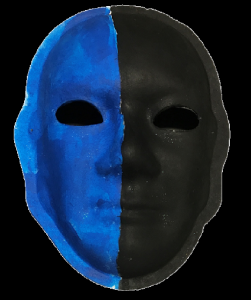 Explanation of Mask: My mask shows my emotions of having a military related illness. Even without seeing combat myself, I struggle with post traumatic stress disorder, alcoholism, depression and a little separation anxiety disorder. I feel cast aside and left with a flawed system that will only assist a small fraction of us, which is why there are 47,000 homeless vets sleeping on the streets any given night. By day, 22 attempts, most succeed, killing themselves. I live a frustrated life and what my mask to show that. 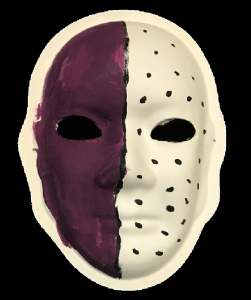 Explanation of Mask: I painted my mask two ways. 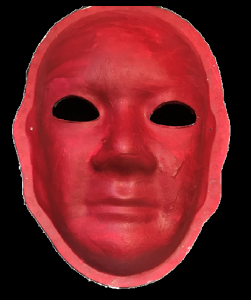 The red part of my mask represents me after my accident and for a few years. I was mad and angry and frustrated. The accident was not my fault, so why did I have to go through all of this? However, after rehab and a few years of healing and processing, I came to terms with what happened to me and let go of the anger. My life became more meaningful, peaceful, and I began to feel a sense of calm. Light began to shine back in my life and I felt hopeful. Glitter is sparkly to me and that is how I felt when I stopped being so mad and became more accepting. My life started to have glimpse of sparkles and it is so much better now. 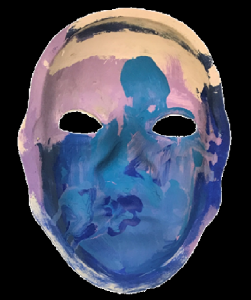 Explanation of Mask: My mask was painted blue to show the peace I have after my concussion. Things were no always peaceful but since I have gotten better, things are better. At first I wanted to be really angry but realized that once I healed, my life would be back to normal again. I put a little silver glitter around my mouth because things were not always peaceful and easy but I pushed through and things are better now. Explanation of Mask: My mask shows that my head is always in a fog and that I try to hide behind my smile. 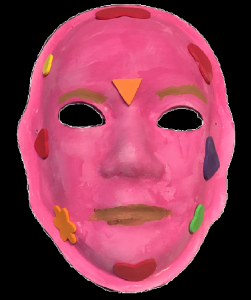 Explanation of Mask: My mask represents my tumor. My tumor left a hole in my brain, which caused me to become forgetful. 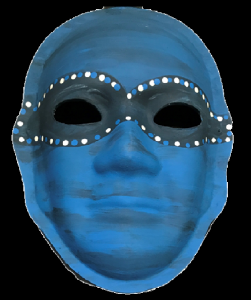 My masks represents the fact that I can’t remember names and people. However, after a couple of years, I realized that my life is a wonderful thing for me. I notice that I really love myself. I feel God saved me to help others and to be happy with myself. I learned that life is a wonderful thing. It makes me happy to care for others. 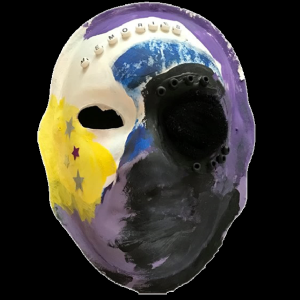 Explanation of Mask: I painted my mask to show how I feel free living with a brain injury. 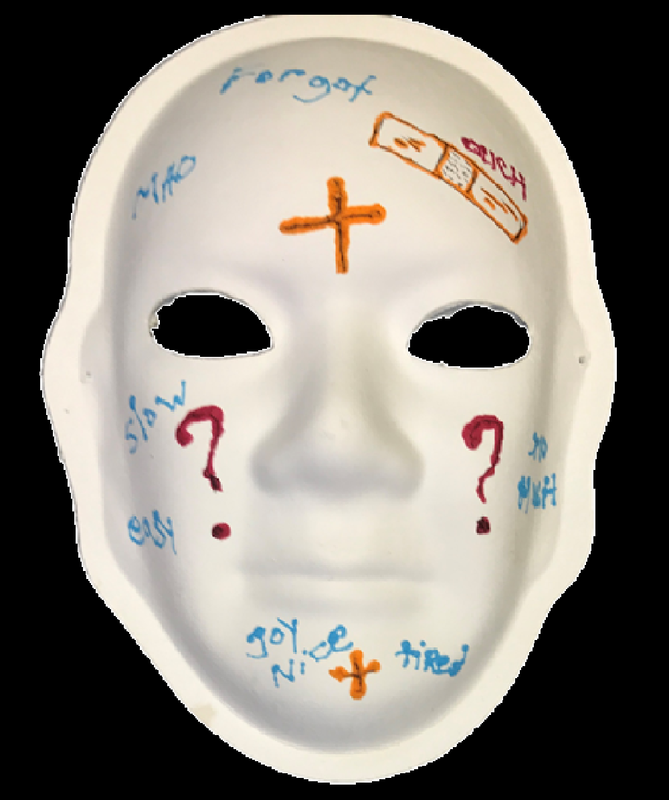 Explanation of Mask: With my head injury, everything has to be shown and easy or I get overwhelmed and confused. Sometimes my confusion turns to anger and I may scream or hit or become vicious. But I will calm down fast because I know that it is wrong to act that way. I am always tired and forgetful but I can also be nice, joyful and easy to get along with. The experience has restored my faith in God and has made me appreciate life. 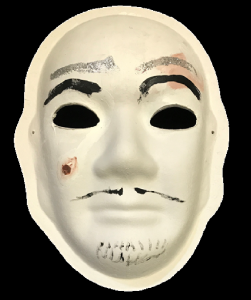 Explanation of Mask: I was in a coma for 38 days after my injury. 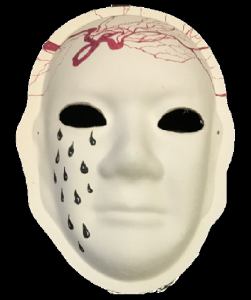 There are many emotions you feel when you have a brain injury. 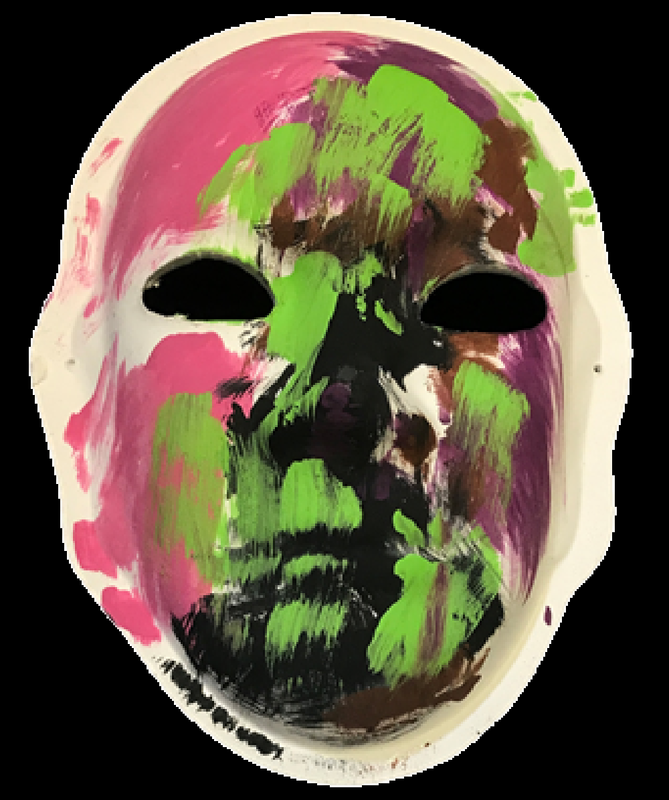 I chose to paint my mask with a color that makes me feel better because it is hard to describe all of the emotions I feel. Brain Injury: Car accident. I was hit by an 18-wheeler while sitting at a stop sign. It knocked my car 165 feet upside down against a house. 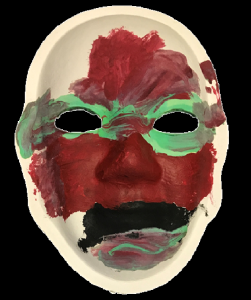 Explanation of Mask: My painted mask shows how I feel having a brain injury. The black side represents the left side of my body that does not work. My injury hurt the left side of my head and body. It left me paralyzed on the left side of my body and also left me blind in my left eye and deaf in my left ear. It also represents the regret I feel not being able to live with my family and having to live in a place that helps people with brain injuries. 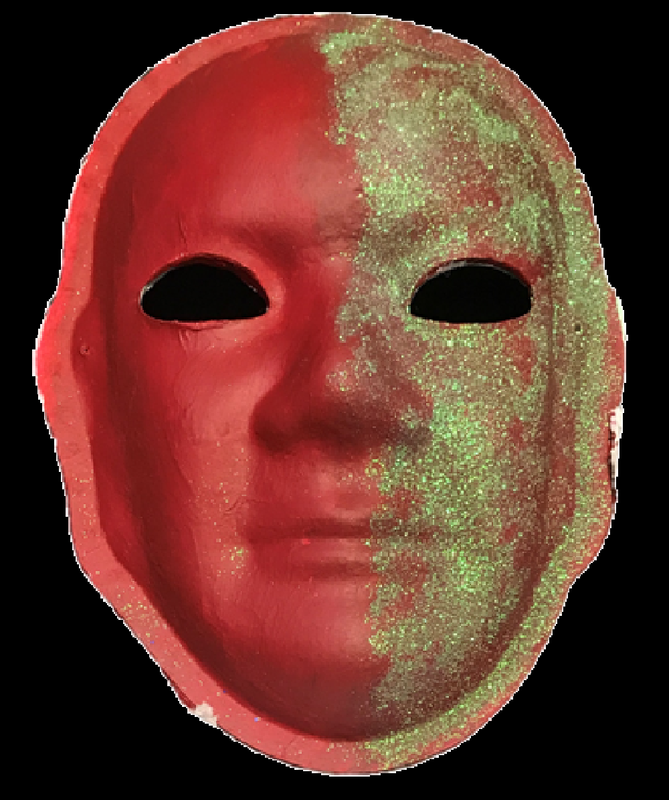 The red side of my mask is how angry I get because this happened to me. 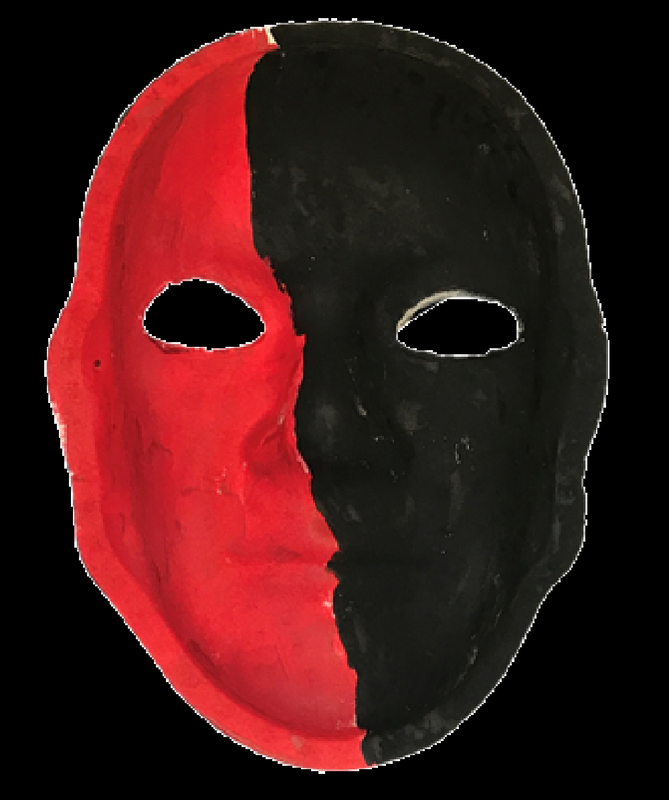 The black is more sadness and the red is more anger. 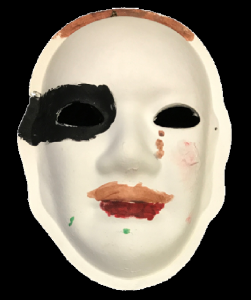 Explanation of Mask: My brain injury was unique to me because brain injuries are different with every person. I painted my mask to try and show that I am different and unique, just like every brain injury. My mask represents that I am unique and my situation is unique. Explanation of Mask: My mask is trying to show how having a brain injury has made me feel but it is very confusing. The red show that I am angry and mad at times. The white shows that I am calm when I am comfortable, at peace or having fun and not struggling. The brown is just a jumble of being mad and also at peace. This is very hard which is why I painted my mask this way. Explanation of Mask: The cross on my mask represents Jesus Christ, who I believe, kept me alive during my accident. It also represents the Lord’s love for me, and I think that is awesome. I am happy that I can still see out of my left eye even though it takes effort. For that, I am very thankful which is what the yellow represents on my mask. The red shows that I really miss dancing including hip-hop, ballet and acrobats. And, the black around my eyes represents the dark days I have had. But, I look for the positive and thank the Lord for all he has done for me. Brain Injury: Fatal car accident at 19 years old, coma for two weeks. Blood loss resulting in right frontal lobe atrophying. Explanation of Mask: I painted this mask showing how my brain injury made me feel bad. My memory is bad, and I have difficulty writing stories. I miss my job as a postal worker. I also miss my wife and kids. Before my injury, I loved going to old car shows with my friends… but I don’t anymore… and I miss that too. But, I am able to go to Tennessee to visit a friend which I enjoy. Riding around town with my friends Pat and Garden makes me happy now. Brain Injury: I was beaten and robbed in 2005. 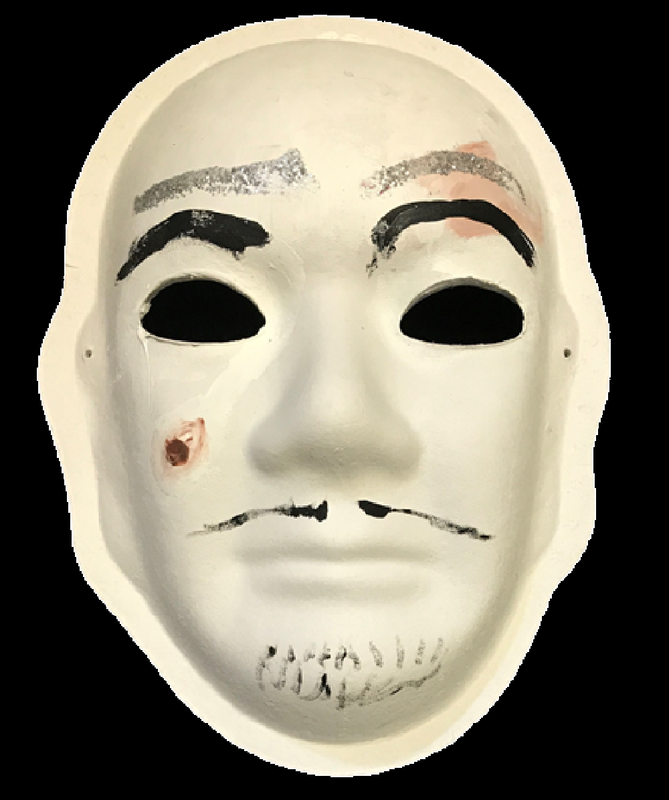 Explanation of Mask: The black eye on my mask represents the fact that I lost my right eye as a result of my injury. The white above my eyes show that I have no memory and a lot of cognitive issues and confusion. 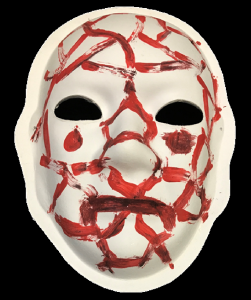 My injury has been the worst thing that has ever happened to me, so I want my mask to show my pain. The brown tear from my left eye means that I am tired and aggravated but the tiny sparkle shows that I have learned that I have to continue on. My mask also shows that I appreciate the staff who have helped me but I am also ready to move on. I want people to know that I struggle everyday but I work hard. 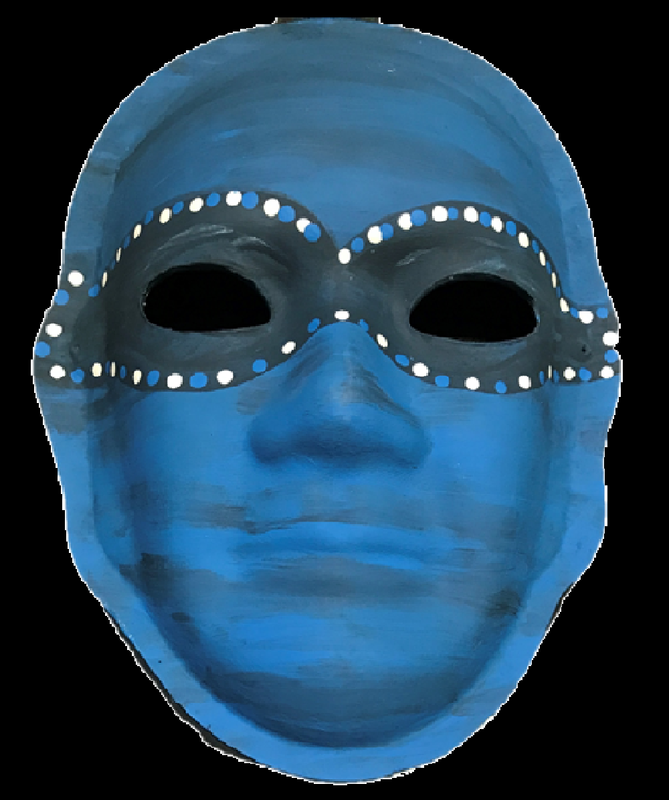 Explanation of Mask: The mask brings me joy because it goes on my face and it is blue. I painted my mask blue and purple because those are my favorite colors, and they give me peace and comfort. 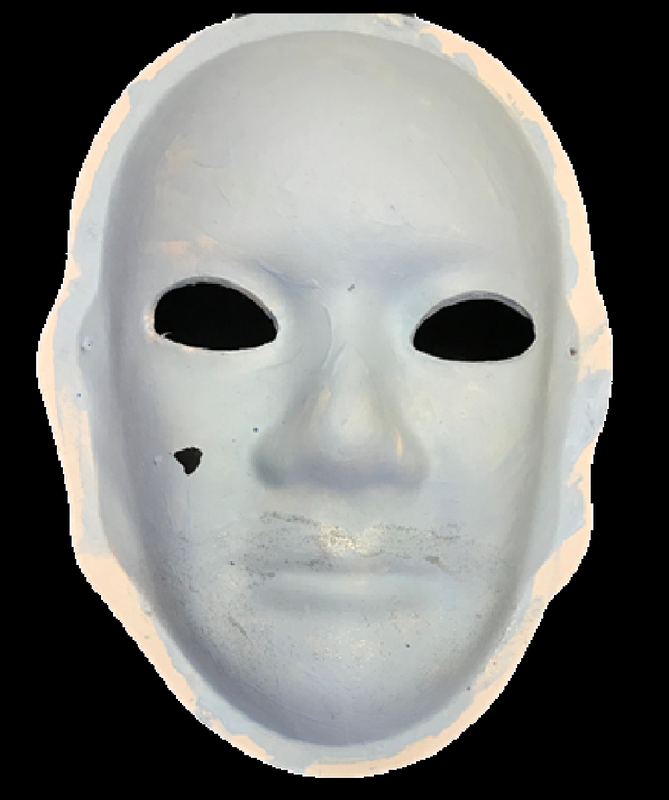 The white on my mask represents the confusion I feel as to why I am here. It also represents the questions and confusion I have as to the reason I can’t walk or work on cars anymore. 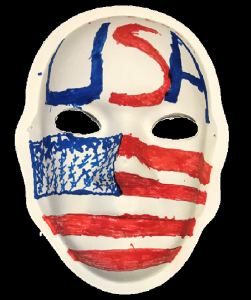 Explanation of Mask: I am an American but I am not free to do what I want because of my brain injury. I live in a nice place and that makes me happy. 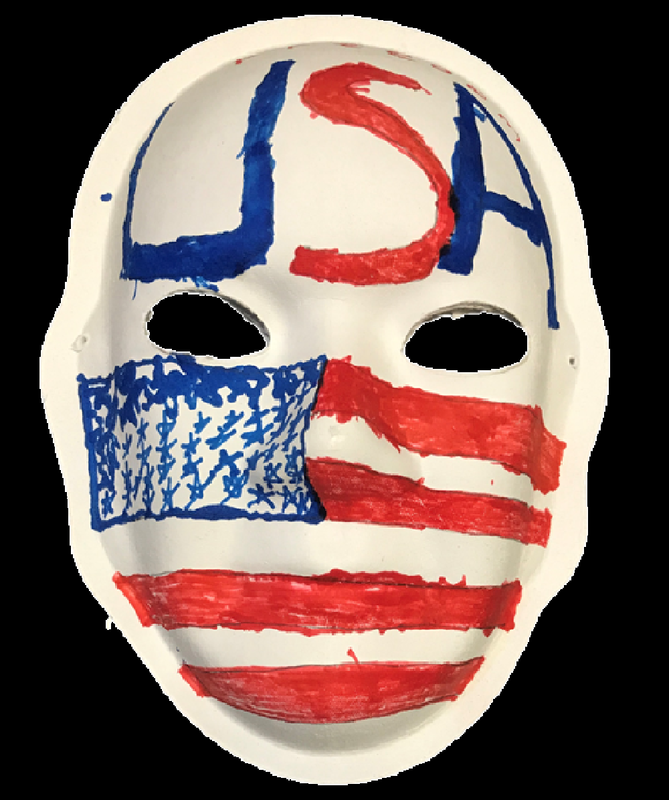 The day I painted this mask, I felt patriotic because I was not embarrassed of expressing my feelings. It is nice to be comfortable to share how I feel. Brain Injury: I was jumped as a teenager by other teenagers. 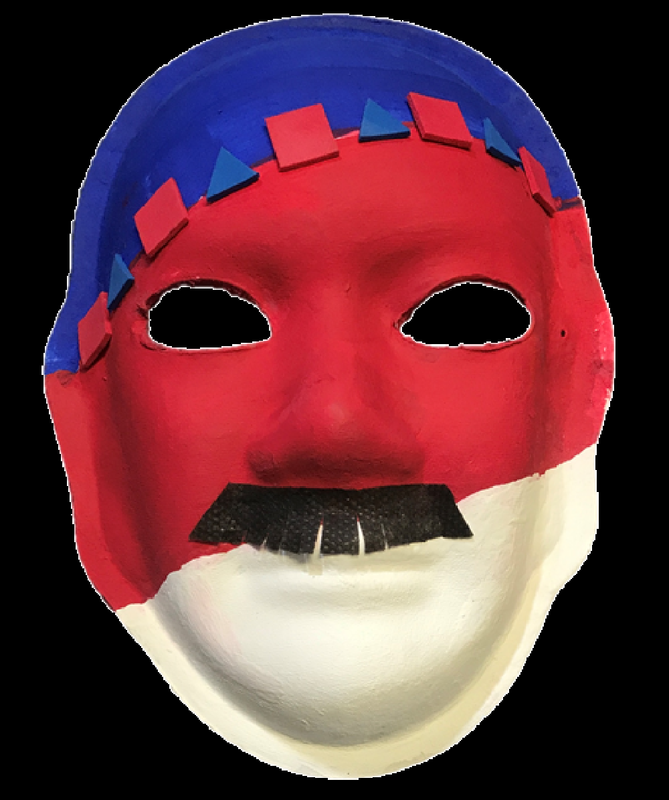 Explanation of Mask: My mask is called “A Sling Dragon.” It flies just like my mind flies. Me eyes are blue because I woke up on the wrong side of the bed. My mask also shows the emotion of being happy because I did not die. 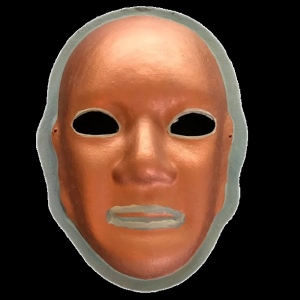 Explanation of Mask: Sometimes it is hard to hide behind the mask while looking after your partner. 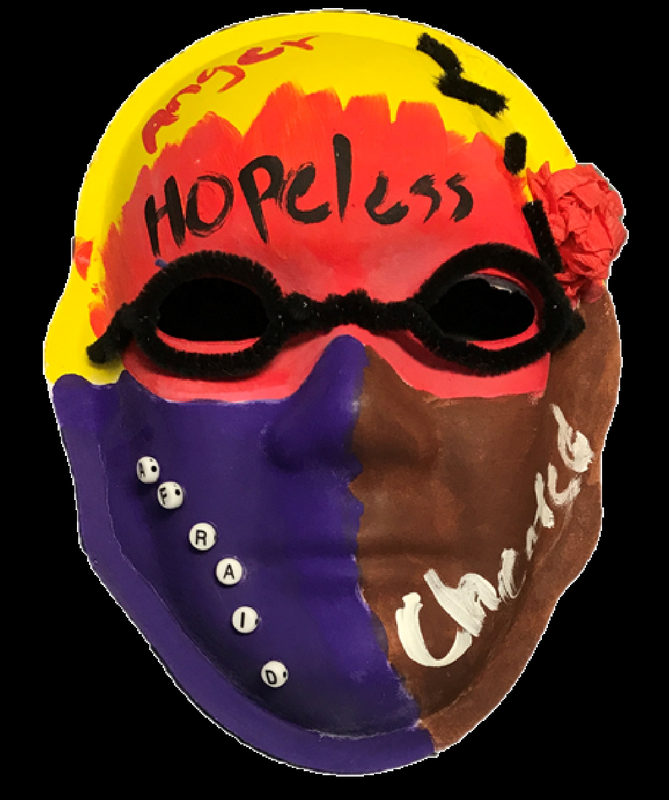 My mask tries to show how you must be strong and how you must hide your emotions to protect the ones you care about who had a brain injury. 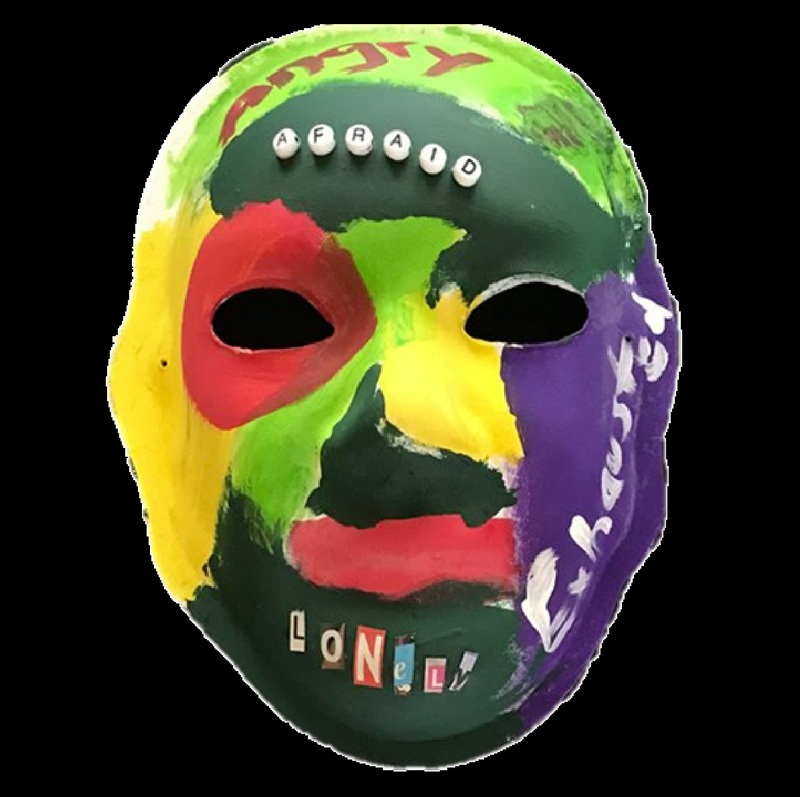 Explanation of Mask: My mask represents my feelings on how hard it is to accept that I had a brain injury. So much of my brain was hurt so the emotions I feel are really all over the place. 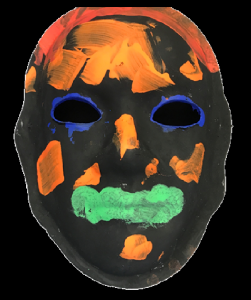 The colors do not really represent anything other than showing the contrast in emotions I feel… confusion, frustration, trapped, happy, mad, sad, free, struggling. Sometimes I feel completely like myself but others say I act a different way. It is frustrating that I can not really see myself acting differently. I feel like myself but then I also don’t feel like myself and I just do not understand why. Explanation of Mask: My mask is called “The Turning of My Mind.” I am smiling sometimes because I don’t know where to go. My heart and soul is everything. The other items represent my brain and the things I have learned over the years. The bottom heart is my family, especially Carl. Everything that I struggle to remember, Carl remembers for me. 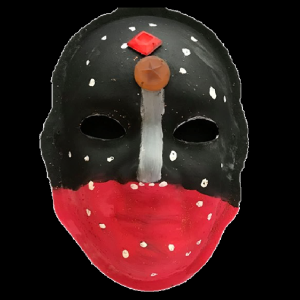 Explanation of Mask: My mask represents how horrible I feel since I had my brain injury. It is still pretty new to me, so I am still angry and do not understand why this happened to me. Everyday I wonder why this happened. My accident has left me confused and angered. Daily, my life is a struggle so that is what I wanted my mask to show. 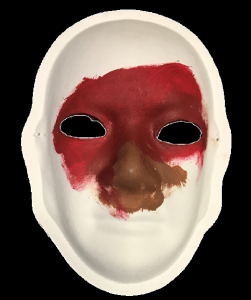 Explanation of Mask: I painted my mask to show that it looks ugly like I feel I look now. Others say I do not look ugly, but this is how I feel. The dark colors represent the darkness I feel. 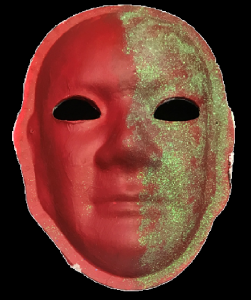 The mark on my mask by my cheek represents how I looked when my eye was hanging out after it popped out during my accident. 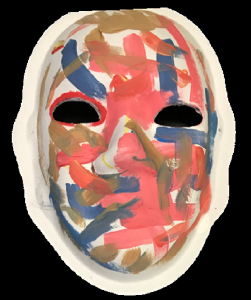 Explanation of Mask: “FRAGMENTED” My brain functions like it is fragmented into disconnected pieces. I have executive functioning problems. I have memory problems. 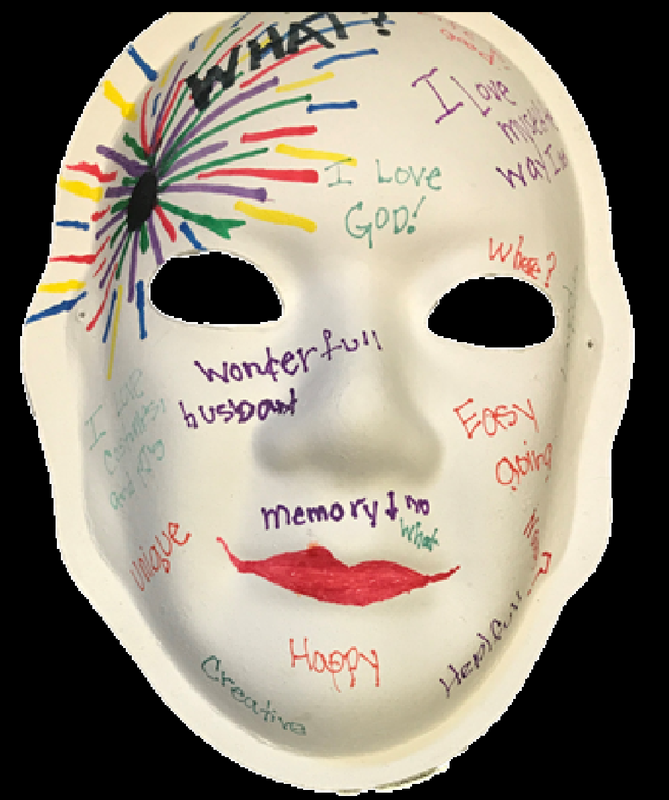 My mask tries to show how I feel… that I don’t really have a life. But, I push forward, and I just do the best I can. Explanation of Mask: My mask is painted to show how having a concussion is very confusing. After I headed a soccer ball, I sustained a bad concussion. Everything for many months was difficult. My thoughts were jumbled. Learning was hard. Bright lights were painful. Taking tests and focusing for long periods of time was a challenge. I would get very tired easily and my brain would get very tired as well. 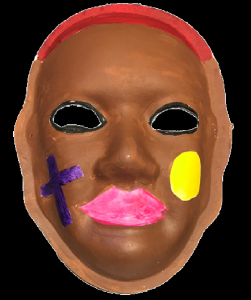 Some of the colors I used are brighter representing the fact that I did heal from my concussion and things got easier. The dark colors show that having a concussion is hard to deal with. And the colors running all together just shows how concussions can make you feel all mixed up and confused. 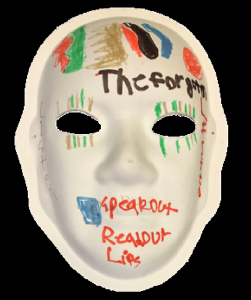 Explanation of Mask: My mask shows how I feel divided between who everyone wants me to be and who I can be. I try and make everyone happy and also try and make myself happy. Trying to make all of this match up is what I want to do and show others but I always come up very short. I am trying to show these feelings in my mask. 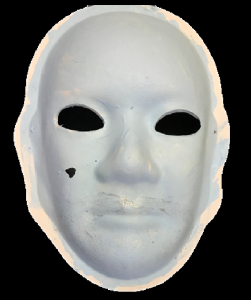 Explanation of Mask: When I was injured, education about a head injury did not exist at all. 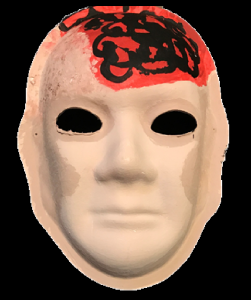 It was only over time, with exposure to other survivors, that I have been able to answer the questions in my head about why I can not remember like others do. 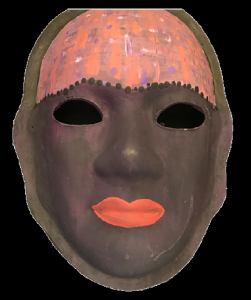 Remembering details is very hard for me as i seeing in 3-D. My mask shows how I felt fractured at first but now feel complete. I can never truly recover and go back to how I was before my injury but I can live in the now and work toward tomorrow. Am I complete? Complete I am! 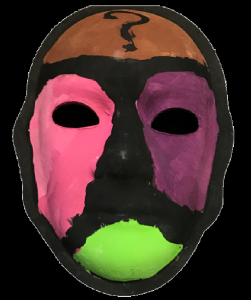 Explanation of Mask: This mask represents when Wesley was first diagnosed with AVM in 1999. The thirteen teardrops signify the thirteen craniotomies Wesley had to endure at a very young age.